Another dramatic day on Wall Street: Stocks nosedived, then they soared. The Dow plunged 567 points at the open on Tuesday and briefly sank into correction territory -- a drop of 10% from its record high. But those losses quickly vanished, and the index ended the day with a mirror-image gain of 567. It was the Dow's biggest point increase since August 2015 and the fourth-largest in history. The percentage gain of 2.3% is the biggest since January 2016. The huge swing shows how volatile trading has become in what was once a calm and booming stock market. "We had an extreme sell-off followed by an extreme bounce," said Peter Kenny, an independent market strategist and founder of Kenny's Commentary. 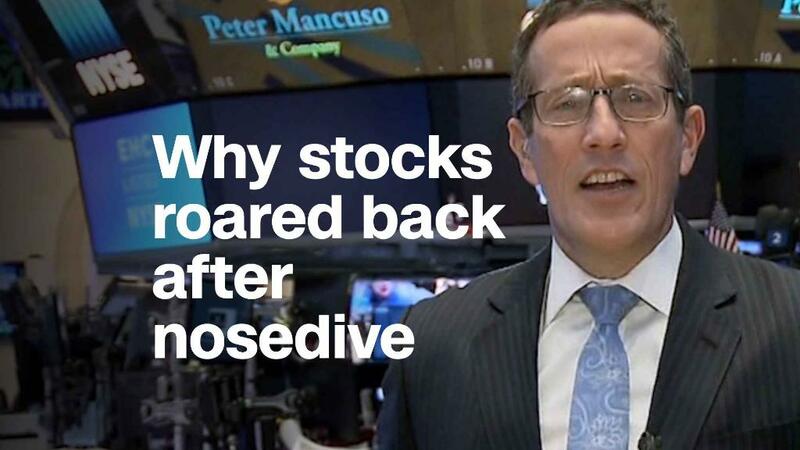 "It was a massive reversal: Nearly 1,000 points on the Dow is mind-bending." After starting the day sharply lower, the S&P 500 closed with a 1.7% gain, its best since November 2016. Bespoke Investment Group said it was the biggest open-to-close rally since 2011. The powerful comeback may reflect a realization by investors that the economy is still strong, even if stocks flew too close to the sun earlier this year. "Sometimes the market does get disconnected from economic reality to the upside and it needs to get in line," said Jack Ablin, chief investment officer at Harris Bank. However, he said, "the fundamentals of the economy and credit markets remain sound." Related: Are Trump's tax cuts backfiring on Wall Street? The stock market freakout of 2018 hit a crescendo on Monday when the Dow plunged a record 1,175 points. The 4.6% plunge was the index's worst day since August 2011 and knocked it into the red for the year. 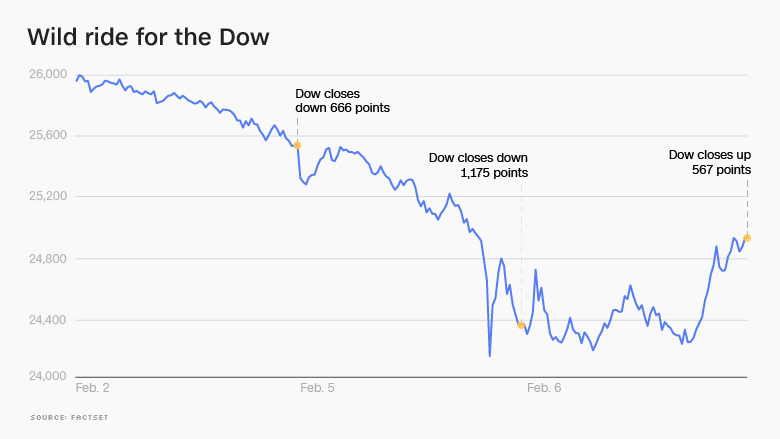 With Tuesday's bounce, the Dow recovered about half the losses from the day before. It's about 6% off its all-time high. David Kotok, co-founder of Cumberland Advisors, called it a "wild rollercoaster ride." He said that when Dow futures plunged 1,000 points overnight, it amounted to "climactic panic selling" that could signal a bottom for the market. On Capitol Hill, Treasury Secretary Steven Mnuchin reminded lawmakers that the stock market is up 30% since President Trump's election. He said the administration is focused on recently enacted policies like tax cuts as a driver of economic growth in the long run. "The stock market has been functioning very well, and we continue to believe in the long-term impact of the stock market," Mnuchin said before the House Financial Services Committee. The tremors on Wall Street spread around the globe. Stocks in Europe and Asia posted heavy losses. Major markets in Europe shed roughly 2%, and stocks in Germany, Sweden and Spain fell into a correction. Japan's Nikkei nosedived 4.7%, while Hong Kong's Hang Seng suffered a loss of 5.1%. After months of unusual calm, fear has raced back onto Wall Street. The VIX index of market volatility spiked by a record 116% on Monday, to the highest level in more than two years. It ripped higher again Tuesday, then calmed down. At the end of the day, the VIX was down about 20%. David Lebovitz, global market strategist at JPMorgan Asset Management, said that while volatility may remain "elevated" for days, "we are closer to the end than we are to the beginning." One factor helping the stock market: The bond market has calmed down. The 10-year Treasury yield spiked to a four-year high of 2.85% in recent days because of worries about inflation. But it receded significantly on Tuesday, to 2.79%. That's a relief because investors have become concerned that the era of extremely low interest rates that propped up stock prices for years may soon be over. The fear is that the U.S. economy could overheat, forcing the Federal Reserve to aggressively raise interest rates. That could take a lot of air out of the stock market. Despite the heavy selling, the Dow is still up more than 6,500 points since President Trump's election. But that's down significantly from the 8,000-point gain it was showing a few weeks ago. It's becoming clear stocks ran up too far, too fast in the euphoria over Trump's tax cuts and the improving economy. The U.S. unemployment rate is sitting at 17-year lows and global growth has gained momentum. "The tax cut euphoria drove stocks up at an unsustainable pace," Scott Minerd, global chief investment officer at Guggenheim Partners, wrote in a research note. Market analysts have long been saying the market was overdue for a cooling-down period. Now that the sell-off has happened, at least some investors feel emboldened to start buying again. "The fundamentals are great. Earnings have been on fire," said Ed Yardeni, president of the investment advisory firm Yardeni Research. "I'm still bullish." -- CNNMoney's Donna Borak and Rishi Iyengar contributed to this article.